I think it goes without saying that adding personality and character to your home is so important. A lot of people fall into the trap of buying a bunch of generic filler pieces to quickly style their bookshelves and walls and the result is often underwhelming – not to mention you’re more likely to grow tired of these pieces. The answer is to collect and curate art and accessories over time that reflect your style and personality. I know, easier said than done — but you have to start somewhere! Swap out those generic pieces as you collect more meaningful ones. Since the options can be a bit daunting, I’m sharing some of my favorites with you today, favorites that I’ve collected over years and countless hours of perusing artists’ work. Can meaningful pieces still look very very wrong? Yes! In a future post, I’ll be sharing some tips on how to avoid some of the mistakes I commonly see. While art is SO personal, these are just a few of the pieces I gravitate toward. It turns out my tastes tend happy, colorful, whimsical, “landscapey” and abstract. Let’s get to it. 1 | Llama with Pink Balloons | Gray Malin’s photography is impeccable and has a sense of humor that I really appreciate. This llama would be adorable in a nursery… but it’s not just for babies — I like it equally for any other room in the house! 2 | I Love Colour | If I had to choose a single piece from Jane Denton’s work, I couldn’t – they’re all that good. Cotton and wool TEXTILE ART you guys. Texture obsessed. 3 | Black Sand | On a more serious note, there’s something about this mixed media artist, Christine Flynn’s work that is very nostalgic with a graphic quality that keeps it totally modern. I love all her landscapes. 4 | Rainbow Shade | How about this whimsical beach umbrella by Yan Palmer? Eventide Collective has SO many good pieces. 5 | Aloha | Or this dreamy beach scene by Wendy Laurel (also via Eventide Collective). 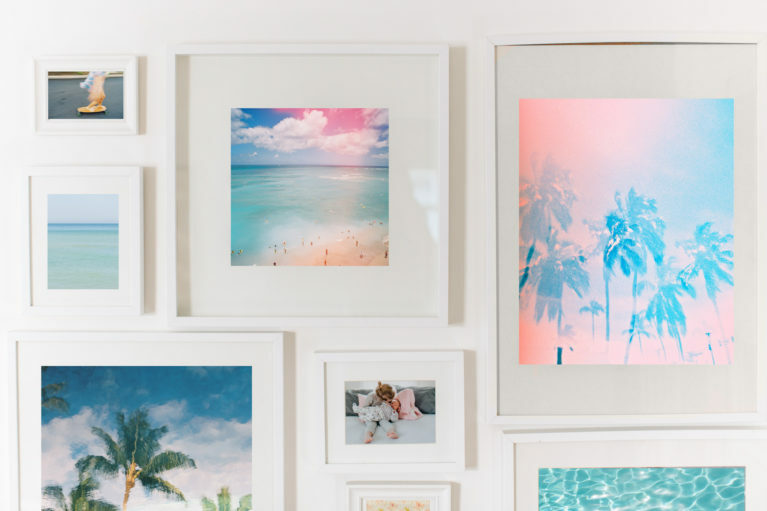 Buy it framed– easy, done. 6 | Ink Blue Watercolour Clouds | What’s not to like about Emily Green’s colorful watercolor abstracts? 7 | Tension – Portrait | One of the best resources for art prints is Minted. I love that you can preview the print in each frame and mounting type (matted, floating, border, etc.) and then just buy it already framed! Visualization is errrthang. I tend to go straight to every Jaime Derringer piece without even realizing it– like this black and white graphic line pattern. 8 | Cloud No. 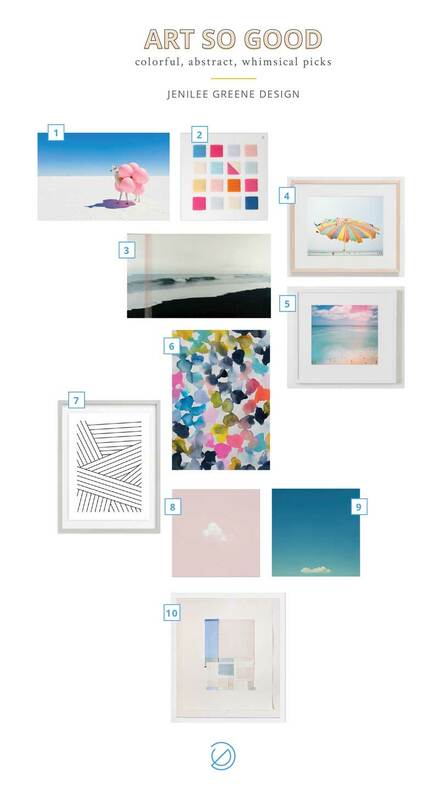 1 | If you’re a cloud enthusiast like me, you definitely need to check out Max Wanger’s cloud series. I would never say no to a pink sky. 9 | Cloud No. 2 | Why get just one when you could have two (or more)? 10 | The Grounds | Art that is neutral but TEXTURAL like this collage by Claire Oswalt via Tappan Collective is going to be a “yes” for me! What are some of your favorite artists/sources?